just exactly how DO you measure the success of the past week? is it based on the number of projects you START ... or COMPLETE? is it in the amount of yarn you BOUGHT or the amount you actually got KNITTED? 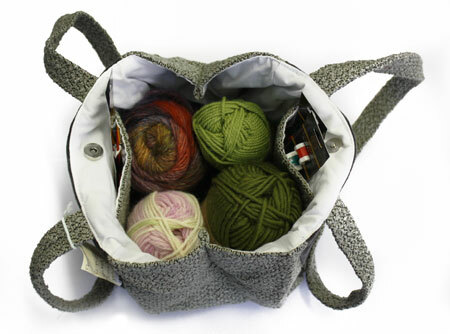 What if you could measure your knitting by the yard? or by the MILE, even! Not much knitting actually done this week ... i've been crocheting just a bit for something different. trying to get a bit ahead on the scarf options for the rest of the year actually! and when i look at my scarf i feel like i should apologize for not having more done . . in my head i hear "it's just 3 stripes wide so what's the big deal? why's it taking so long". . . . 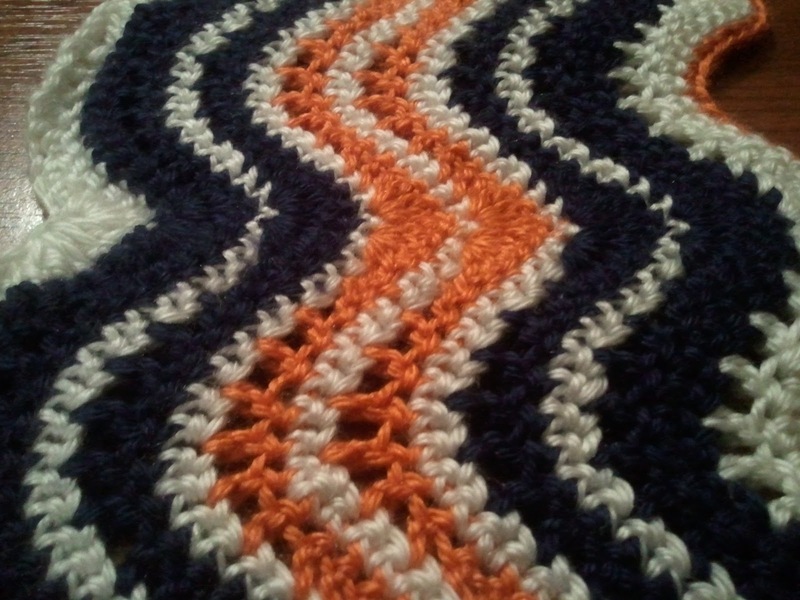 BUT consider this: i chained 278 stitches for the foundation row. Each of the Orange and Blue stripes took approximately one hour to do, and the smaller white ones in between take about 20 minutes. (278 + 2,240 + 2,870 = 5,282 stitches) . 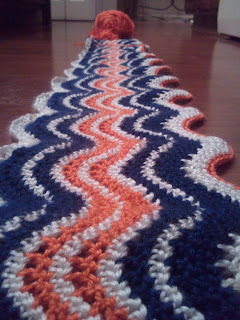 . . 8 hours for the wide stripes .... another 6ish to finish the smaller ones and do the outside orange border . . . so easily, 15 hours of time . . . and 300+ yards of yarn . . . factor in the distractions of life, the responsibilities of work, the time i'm driving and can't actually knit or crochet . . how 'bout that! not such a bad record of the week after all. do you ever find yourself struggling with things like that? comparing yourself to someone else .. what they do, how much they have, what they've accomplished, what they drive/wear/live in . . . how much education they have . . how much YARN they have . . . turmoil seems to brew rather than living a simple, uncomplicated, uncluttered life when such thoughts work their way into your every day living . . . and yet Christ calls us to abandon it all, and simply follow Him! to be a sheep that knows His voice ... to allow Him to lead and thus remove ourselves from the "details" that so often become tangled and that clutter every corner of our minds. Walking close to Him will establish a Companionship unlike any other . . one in which Peace abides . . and where such dwelling allows a freedom to relax and enjoy rather than measure and compare against others. For me the best kinds of friendship are those that are comfortable in the quiet. When you can simply sit alongside someone and just enjoy being in their presence. No need to fill every moment with idle conversation or giddy chit-chat .... when "space" is just as entertaining as watching a movie . . or sharing a meal . . when you can sit and knit, glance over and check on their progress . . just being fully aware that their concern and regard for you is as genuine as yours is for them! And in those quiet moments you soon learn to discern the intensity of a single spoke word .... when you know which breaths signal frustration rather than relaxation. This only comes with time and true investment . . with letting go of yourself, dropping the guard per se, and seeking the other's best interest. And when i have this same mindset with my time with the Lord i soon realize how sweet the fellowship is ... and in that quiet i can hear His still, small voice. He's not having to use His "outside, playground" voice in order for me to recognize what His good and perfect will is for my life . . . and that is such a sweet place to be ... to sit alongside Him, to feel the reassurance of His presence in that gentle nudge along the way . . "Quiet" does not have to indicate 'gone and forgotten' . . but rather "comfortable and obedient" . . . Safety and Security . . .
My sheep hear to my voice; I know them, and they follow me.